IT PAYS TO BE ON TREND. 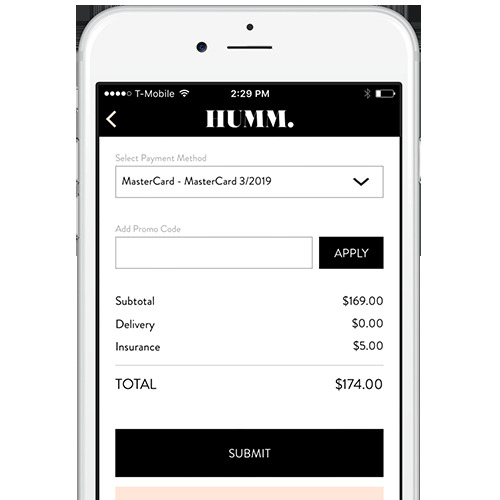 Welcome to the Fashion App that makes money for you. HUMM. was founded on the belief that all women should have access to designer brands. We empower women to own the clothes they’ve always desired and to share them with a collective of strong, successful women. HUMM. gives women the opportunity to do what they love and look amazing while doing it. We connect women who desire to rent an item for a special occasion to worldwide network of women interested in renting out their wardrobe for a fraction of the retail price. We provide access to a never-ending wardrobe of luxury labels and goods, allowing women to freely browse and rent dresses by brand, color, size and location. List your closet in three easy steps. View designer dresses, bags and shoes from women around the world! Filter by designer, color, size, price and more! Select a date, delivery and payment method to secure your rental! The owner will confirm your request. In-app message to organize a place to meet or ship the item to the renter. Once returned, rate your renter and get paid! Saving for a new dress or pair of Choos? Use your lending income to buy those lust-haves you’ve been saving for. 2. with the frustration that comes with wanting to look absolutely fabulous, but not having one goddamn thing to wear. Want to eliminate that humm moment? A foundation that awards financial grants to women in the worlds of design, fashion, music and the arts, to help them fund them on their way to owning their future. By supporting aspiring hustlers, the Foundation aims to empower creative women to take over the world. Want humm in your city? waitlist your city! i want humm in my city! We respect your privacy. Your email will only be used for our news and updates. Thank you for signing up! You should receive a confirmation email soon.